Billy Crystal's Robin Williams Tribute at the 2014 Emmys Was the Right Way to Say Goodbye: "He Made Us Laugh — Hard"
The entertainment world (and beyond) is still reeling from the death of beloved actor and comedian Robin Williams after his suicide on August 11. 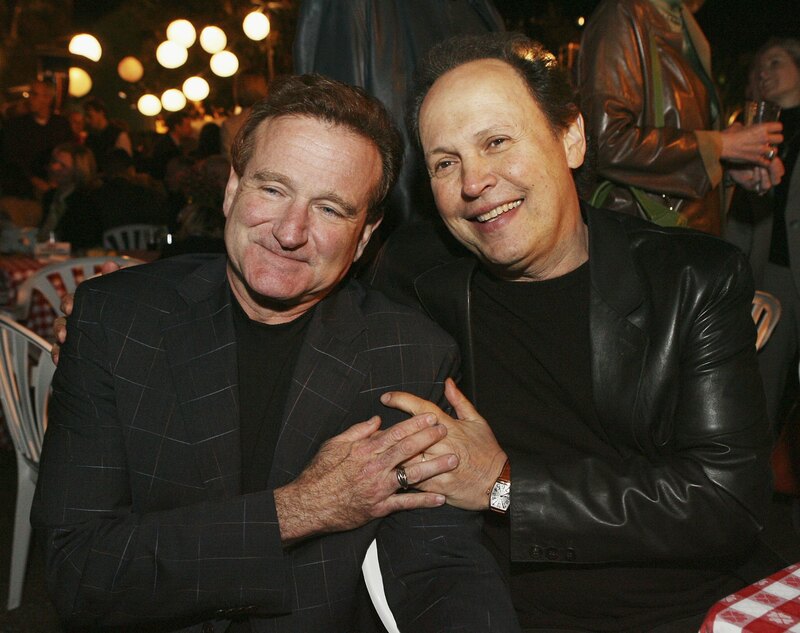 Unlike the VMAs Sunday night, the 2014 Emmy Awards didn't miss the mark when Billy Crystal honored Robin Williams during Monday night's ceremony. Although there was a concern whether just one person could adequately say goodbye to a man known for his multitude of dynamic characters, Crystal — who was a personal friend of Williams — proved it could be done with a tribute that was (almost) as eloquent, heartfelt, and funny as the man he was honoring. Tributes to the late comedy genius have come from celebrities, his family, and Twitter, but it was touching to see such a large portion of the entertainment industry acknowledge his passing together. Williams had a plethora of memorable roles over the years, but one of his earliest roles was on TV as the alien Mork on Mork and Mindy . A hallmark of pop culture (my cats are even named after the duo), the character Mork started on Happy Days and then got his own spinoff. Recently, Williams starred in the CBS show Crazy Ones with Sarah Michelle Gellar. So it was only appropriate that the Academy of Television Arts & Sciences took its turn to honor him at the annual award show. The news of his death is still raw, and I'm sure it was difficult for his real-life friends and colleagues to speak in such a forum about it. Crystal, who hosted the first Comic Relief fund-raiser show with Williams and Whoopi Goldberg in 1986 and who starred in a few movies with his friend — including Father's Day (alongside Emmy-winner Julia Louis-Dreyfus), handled the tribute with grace after a lovely rendition of "Smile" from Sara Bareilles for the "In Memoriam" segment. Crystal started with the truest words about Williams, "He made us laugh — hard. Every time you saw him." After giving a few anecdotes of the off-the-cuff jokes that Williams was known for, he talked about what a true friend he was, saying, "As genius as he was onstage, he was the greatest friend you could ever imagine — supportive, protective, loving." Then Crystal went into a beautiful speech, comparing Williams to the stars in the sky. It is very hard to talk about him in the past, because he was so present in all of our lives. For almost 40 years, he was the brightest star in the comedy galaxy. But while some of the brightest of our celestial bodies are actually extinct now, their energy long since cooled, but miraculously, because they float in the heavens so far away from us now, their beautiful light will continue to shine on us forever. The glow will be so bright, it will warm your heart, it will make your eyes glisten, and you'll think to yourselves, Robin Williams — what a concept. Crystal balanced that fine line of humor and sadness and clearly meant every word he said — and we more than believed every word he said. As Crystal said about Williams, "The brilliance was astounding, the relentless energy was thrilling." Let's remember Williams that way.